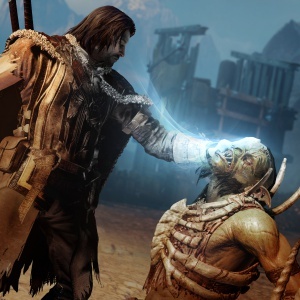 Managing Editor Josh Vanderwall says: Middle-earth: Shadow of Mordor is one of those games that I heard about months prior to release, but never really paid much attention to. I love Tolkien, to be sure, but I've seen and played a lot of adaptations of Middle-earth-related things, and haven't been terribly impressed in recent years. Shadow of Mordor, it turns out, is the clear outlier in the occasionally-glutted market of Tolkien-related media. Mordor shines in both narrative and gameplay, with a lore-packed story centered on your post-mortem quest for revenge. With an ethereal mentor, you're looking to beef up your fighting skills, recruit an army, and take down the combined forces of Mordor. Shadow of Mordor offers a healthy combination of melee, ranged, and stealth combat, allowing you to focus on mission in whichever style suits you. The core of the game is the counter-based combat system. Surrounded by uruk and spamming your attack button, you'll need to watch for the Counter prompt, which will keep you from dying, while also taking down your enemies. As you progress through the story, you'll get a very real sense of the increase in your power level as well. You'll unlock new abilities as you go, which drastically alter the way fights play out. Eventually, you'll get the Brand ability, which basically turns an uruk into your minion. You'll likely find yourself doing this over and over in every fight, until your minions outnumber the opposing forces, and you can just wander off and let them finish the battle. It is, in a word, glorious. The much-touted Nemesis system is almost as incredible as the hype around it. You'll encounter thousands of uruk, but occasionally, one of them will get a brief cinematic and a name. Each one has a distinct look and personality. They remember your victories, they remember your defeats. If you run away, they will taunt you about that when they see you again. They'll also fight among themselves for rank and position in Sauron's army. Between the novelty of the Nemesis system, the visceral brutality of the combat, and the lore-steeped storyline, Shadow of Mordor was simply too good not to recognize. Next up, Game of the Year 2014. Click here!